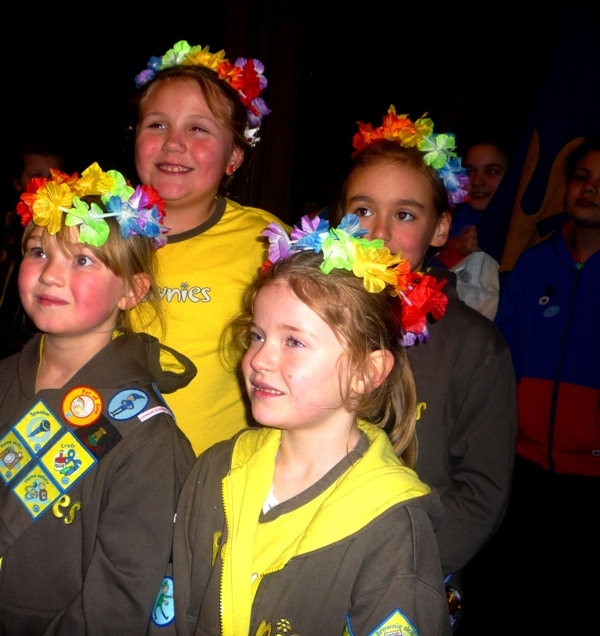 For World Thinking Day 2016 Girlguiding Isle of Wight members and friends celebrated in traditional style but with new and exciting activities added including celebrations for the Senior Section 100years. 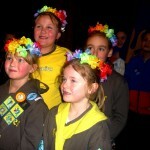 World Thinking Day is one of the most significant dates in the Girlguiding calendar. On the day, Guides and Girl Scouts everywhere think of each other and of their commitment to international friendship and understanding. 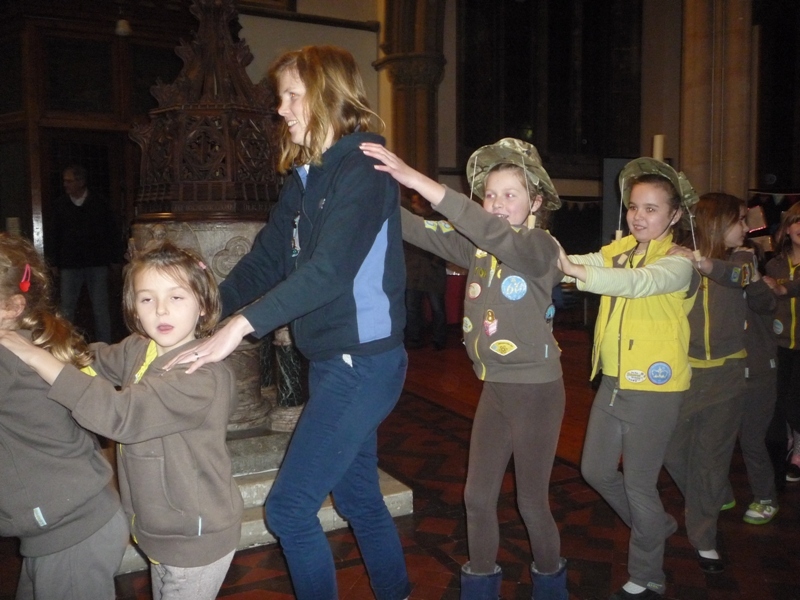 It is celebrated each year on 22 February, which was the birthday of both Robert Baden-Powell and his wife, the former World Chief Guide, Olave Baden-Powell. 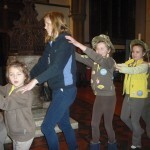 As well as learning about Guiding around the world, World Thinking Day is a great time to raise money for WAGGGS (World Association of Girl Guides and Girl Scouts) World Thinking Day Fund, which supports and grows Guiding across the World. 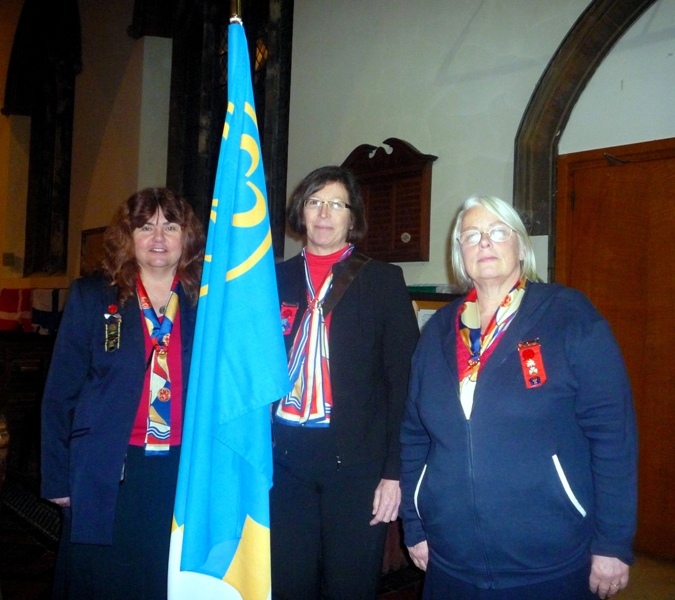 Island celebrations took place at All Saints Church, Ryde on the 22nd of February with Canon Graham Morris welcoming everyone to the church including; Island High Sheriff Ron Holland and Mrs. Susan Holland, Cllr. 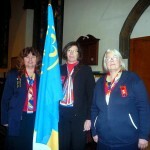 Charles Chapman, (Chairman IW Council), Sir Guy Acland, Mrs. Anne Twining (Patron) and Mr. S. Twining, and Girlguiding IW President Patricia Partridge. Rev. 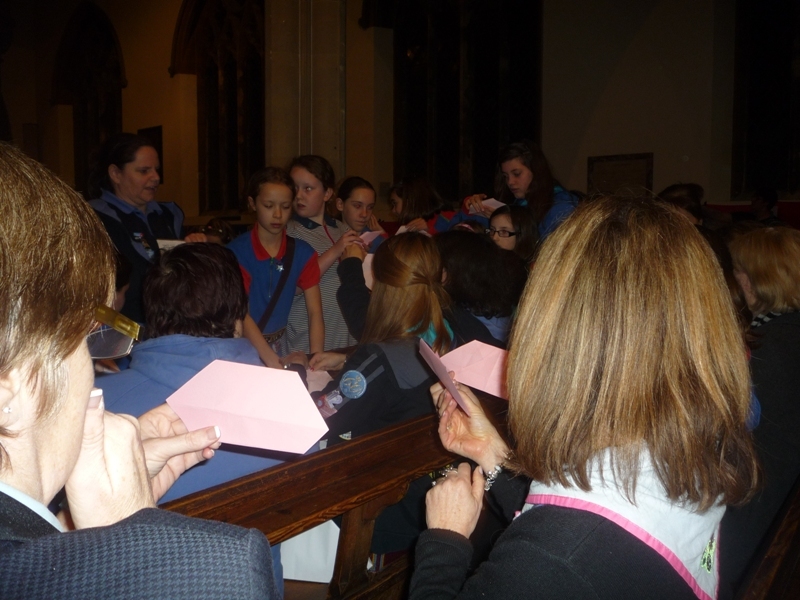 Janice O’Shaughnessy (Girlguiding IW Chaplain) led the service which saw all the girls wearing a hat from another Country to remind them of their 10 million Girlguiding and Girl Scout sisters around the World. 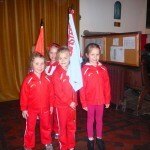 It was easy for everyone to join in with hymns and songs as words were on a big screen. 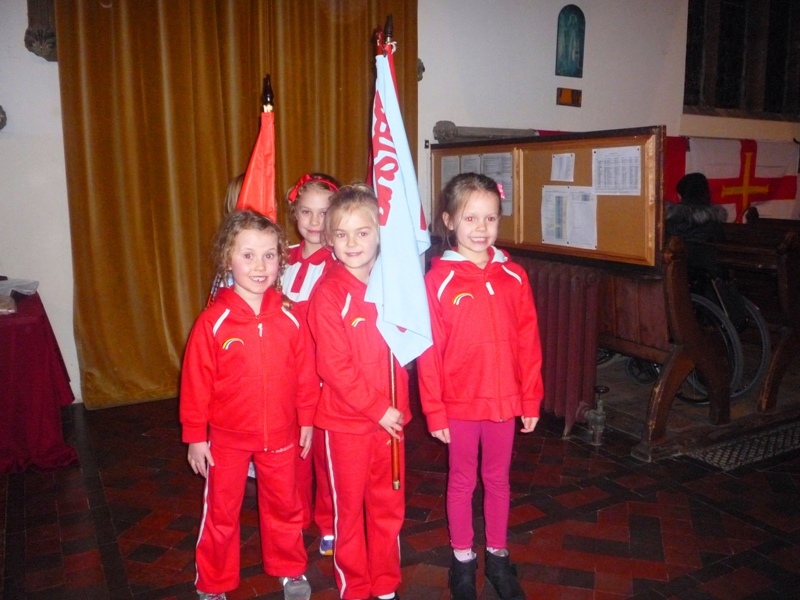 These included ‘He’s got the Whole World in His Hands’, ‘Kum Ba Ya’, ‘A Ram Sam Sam’, ‘This Little Guiding Light,’ and ‘Cuddly Koalas’ as well as The National Anthem. 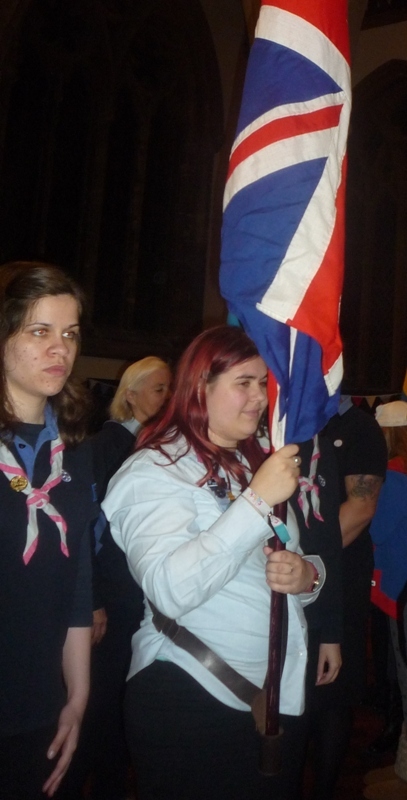 Unit flags were paraded by Rainbows, Brownies, Guides and Senior Section and to remember the 100 years of the Senior Section three members of the Trefoil Guild who had been Rangers carried the World Flag. 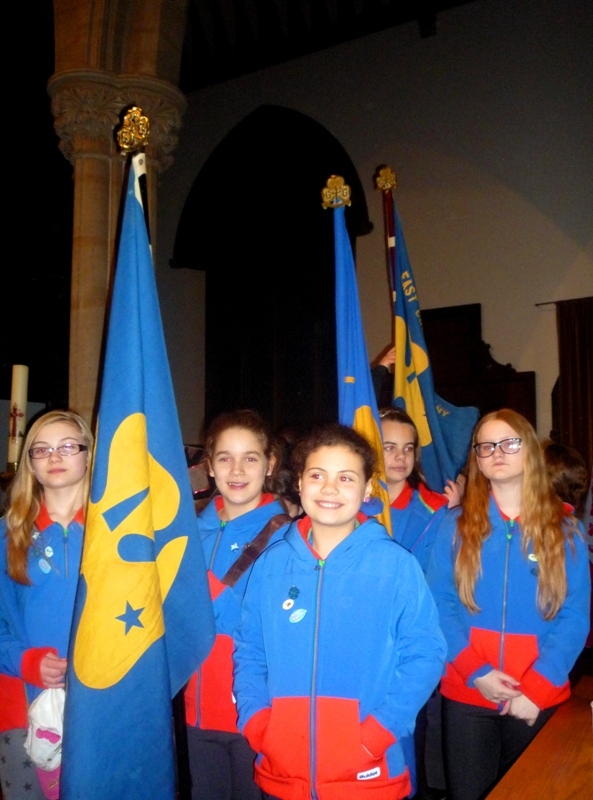 Members of Girlguiding IW, who are accomplished in campanology, chose to ring the bells of All Saints prior to the service whilst a Guide read a Prayer, Brownies read and performed actions to a poem and Guides performed a ‘silent’ song. 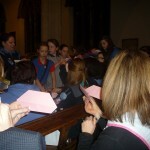 Other activities, planned by Marion O’Nions, included the lighting of a World Thinking Day Candle, making a human friendship chain around the inside of the church and making a paper heart. Island Commissioners Shirley Saunders and Lesley Clifford presented long service Awards to a number of leaders. There was even a surprise presentation to Shirley Saunders of an Island Standard Award. 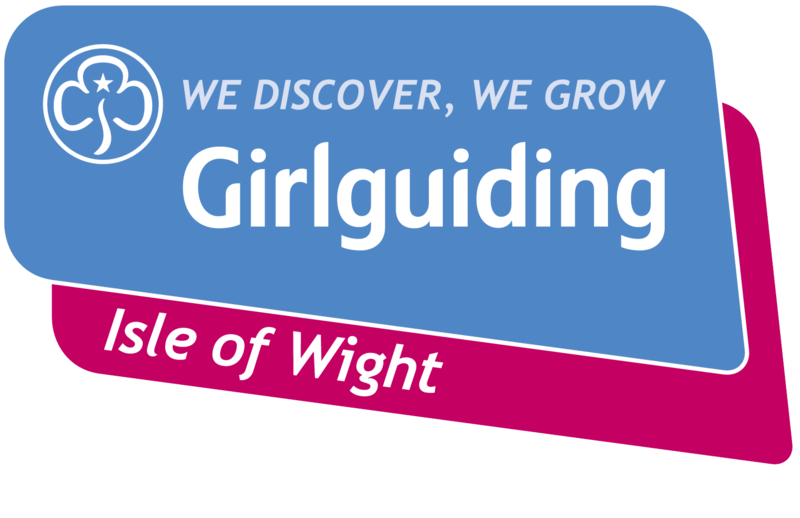 Girlguiding IW has over 1,000 members and for anyone seeking more information please see the link on this website. 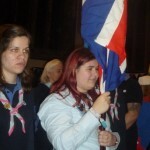 Most of the Island’s members attended this event but some units had their own World Thinking Day celebrations whilst others enjoyed attending two events- their unit event and the all Island one. 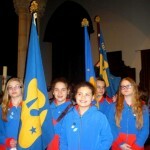 11th Newport Guides make their Promise.